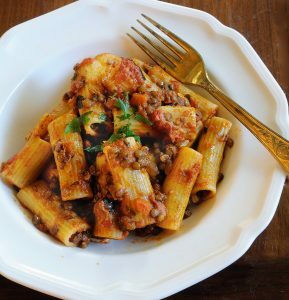 Rigatoni With Lentil Ragu :: Oracibo.com - Food, Travel, Design and Cooking! I like how you shifted the name from Bolognese to Ragout Phyllis! 😊. I have to admit it would look kind of like a Bolognese and it’s bound to be tasty! But Chris…the Bolognese would be totally annoyed with me if I called it a Bolognese Sauce…as you know there are rules to be followed! Did you know there is actually an “official Bolognese sauce” recipe recognized by the Accademia Italiana della Cucina? Very strict! And only fresh Tagliatelle/Fettuccine will do, none of that English nonsense with spaghetti! Ragu is remains…not Ragout! Didn’t want the the Bolognese to sic the Sauce Police on me!